The opening of the Leonard P. Zakim Bridge, back in 2003, was an important moment for Boston: a cap on the colossal Big Dig highway project, and a boon for urban aesthetics. The striking bridge, with its ship’s-mast shape, became an instant Boston landmark, a symbol of the city’s connection to the sea and its commitment to the built landscape. But the popularity of the Zakim had an unanticipated consequence: It has also helped to spur a welcome movement to create more attractive and meaningful landmarks around the city — bridges, in particular. The Longfellow Bridge, which was badly in need of structural renovation, is also seeing a restoration of its famous, stately salt-and-pepper-shaker posts. 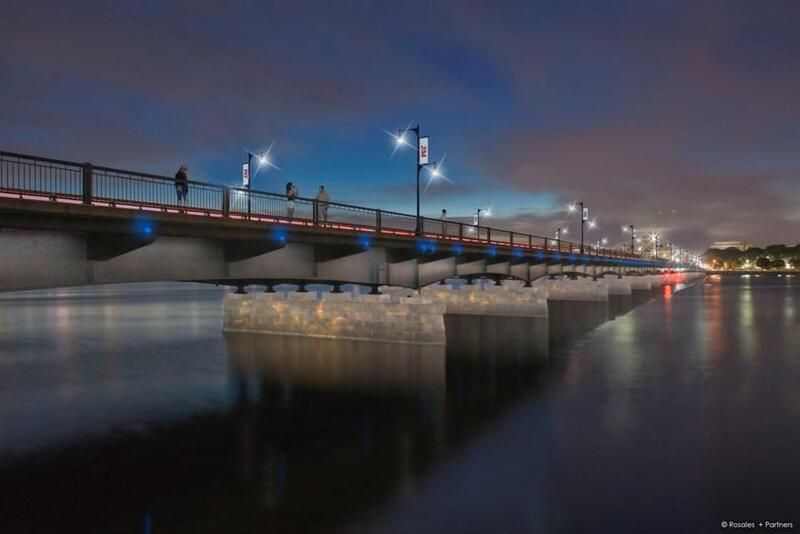 And last week, the Charles River Conservancy announced that an anonymous donor has given $2.5 million for lights — with special meaning — along the Harvard Bridge, which connects Massachusetts Avenue from the Back Bay to MIT. Compared with the Zakim and the Longfellow, the Harvard Bridge is a low-key landmark: flat, with limited room for aesthetic improvements. But the lighting idea is inspired. It pays homage to the 1958 MIT prank that made the bridge famous, when Lambda Chi Alpha members “measured” its span by laying a pledge named Oliver Smoot down, repeatedly, end to end. The resulting 5-foot-7-inch increments, known as “smoots,” were marked with paint that is touched up by students each year. The new design will use energy-efficient LED bulbs, along the roadway and pedestrian path, to set up lights along the bridge in 30-smoot increments. The lights will go on in sequence, commemorating the fraternity pledge’s smoot-by-smoot progress along the bridge — and making the bridge both safer and more eye-catching. Notably, the idea, which came from Boston architecture firm Rosales + Partners, was the winner of a contest run by the conservancy. A competition is an interesting way to conceive and choose civic improvements and a creative way to bolster local spirits. So are the lights themselves. If the Zakim design threw down a gauntlet, and other civic institutions feel the urge to keep up, Boston’s landscape can only get better.